For the past few weeks I've been working on a lace project with some qiviut yarn I got when we were in Alaska last year. It's not a complex lace pattern by any means but it does require a bit more attention than I can give at times. I've had some not-so-great-thinking days that even simple lace has been beyond me (and some decently thinking days where lace was beyond me if I was watching something other than a documentary), so I needed a secondary project to work on that wouldn't require much thought. Yes. That means I made more socks. I actually also got this yarn when we were in Alaska last year but this isn't fancy like the qiviut. 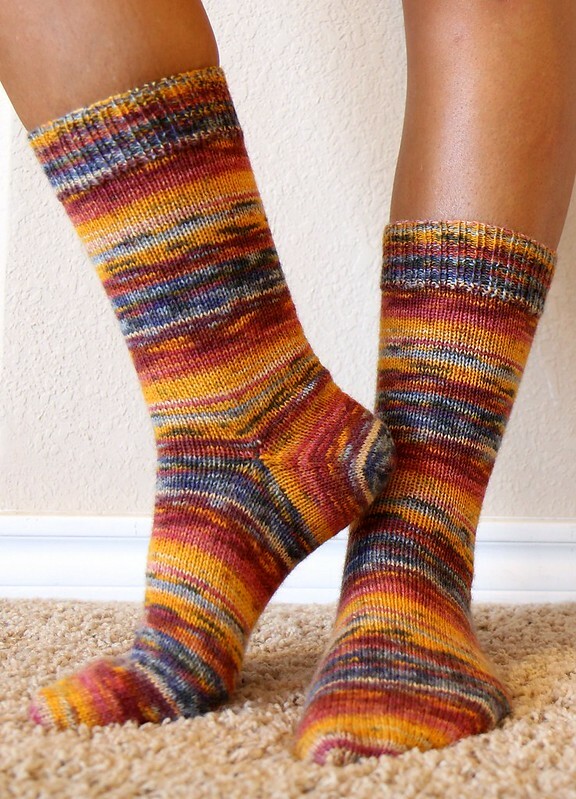 It is Opal sock yarn from their Vincent van Gogh series and I simply loved knitting with it. The colorway was called Der rote Weingarten in Arles, or The Red Vineyard, (based on this painting) but the colors reminded me of my second favorite of his paintings, Cafe Terrace at Night. (My favorite is Irises and is actually the reason irises are my favorite flower, not the other way around as most assume.) So each time I would grab this project and knit, I'd start mentally imagining van Gogh paintings in my head. It was like a little mental museum visit while knitting! As for the sock-ular details, I did anatomical toes on these, using different increases than my Watermelon socks (but the same increase schedule) and I didn't do the increase in line but instead spaced them a bit randomly. I quite like the end result since it doesn't have the straight lines down the sides of the toe. Not a big deal, but something neat, I think. I also did an afterthought heel, the first one I've ever done. I like how it ended up and how it fits, but I had big holes on the side of the heel when knitting it. I understand why it happened and tried to fix it on the second sock but still had an issue. Boo. All holes are now fixed but I'd really prefer it not happen, you know? That will likely keep me from using this heel again in the future. Holes, aside, I quite like these socks and am very happy with the end results. I'm not even half way through my lace project so I'm sure I'll be able to get at least one more pair of socks done before that one is finished. I think Dan is up next with some blue and green striped ones. These socks are number seventeen(or fifteen, depending on how we are counting) for those of you keeping track at home.